One of the best ways to maintain a healthy head of hair is to eat a balanced, healthy diet. Hair loss is often a sign of a nutritional insufficiency, according to the Mayo Clinic. Crash dieting, unhealthy foods that don’t provide nutrients and lack of certain food groups, such as proteins, can all lead to hair loss. Ph.D. Hair loss can happen after four months of deficiency in omega-3 and omega-6 fatty acids. People who have inadequate iron intakes also suffer hair loss, notes the Mayo Clinic. Women may have an especially hard time getting enough iron because they have heavy menstrual periods and become deficient due to blood loss. Fad or crash diets can cause nutrient deficits that lead to hair loss, as can diets that lack proper nutrition, such as those high in processed and fast foods, according to the Mayo Clinic. When a deficiency exists, the body will send nutrients to vital organs first and to the hair last. The type of hair loss experienced due to a nutrition deficit is called telogen effluvium. This occurs when something, such as inadequate nutrition, causes a change in a person’s normal hair cycle, according to the Mayo Clinic. Hair roots may be pushed prematurely into their resting state. Affected hairs fall out. Telogen effluvium also can be caused by emotional distress or physiological stress, like an illness or sudden weight loss. People who have nutrient insufficiencies that lead to hair loss often also have dry skin and brittle hair that breaks easily. Lack of iron can even turn some hair follicles “off,” according to a 2003 study published in the "Journal of Investigative Dermatology." A deficiency in protein that causes hair loss also can lead to frequent colds, fatigue, poor immune function, poor recovery from workouts and anemia, according to according to Harvard University Health Sciences. Hair will grow back when nutrient deficiencies are corrected, but it may take months. 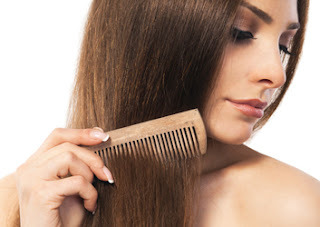 The body requires a variety of nutrients to maintain hair health, especially B vitamins. Vitamins A, C, E and minerals such as calcium and magnesium are also important. A healthy adult requires 0.36 grams per pound of protein each day, while an endurance athlete needs 0.54 to 0.64 grams per pound and a person who strength trains needs 0.72 to 0.77 grams protein per pound, according to Harvard University Health Sciences. Essential fatty acids help cells repair and construct new membranes and help the body use vitamins A and E, which also are needed for hair health. Supporting cell formation is important for hair, as it grows through the formation of new cells at the base of the hair’s root. The cells multiply and form a tissue rod in the skin, which then moves upward as new cells form beneath.